The sad truth is that the “safe” “organic” “natural” or “food grade” products sold as jewelry pickle are only all of those things BEFORE you use them. Even after you use them they are still (relatively) safe for you and your drains, but they are NOT safe for the environment. The retailers don’t have to tell you this because they aren’t selling you the used product, which is FULL OF TOXIC COPPER. Fresh, unused jewelry pickle contains no copper. It is just a dilute solution of an acid like sodium bisulfate (Sparex®, Rio Pickle™, HTH® pH Minus – my favorite! ), sulfuric acid, citric acid (PickleIt™), lemon juice, or vinegar. This changes dramatically after you use ANY type of pickle to clean your jewelry metals. ALL the different chemicals used as jewelry pickle are very effective at stripping copper oxides off your metal. 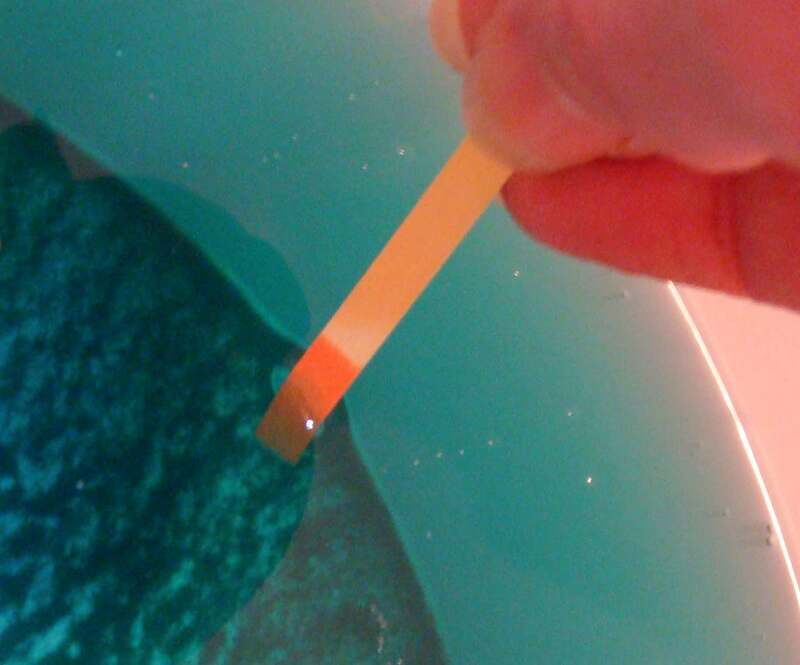 As a result, pickle turns blue because copper molecules have been converted from solid metal into a contaminant in the liquid solution. Even pickle that has not turned blue yet is loaded with copper. The bottom line is this: If pickle has been used to clean metal, it is contaminated with copper. 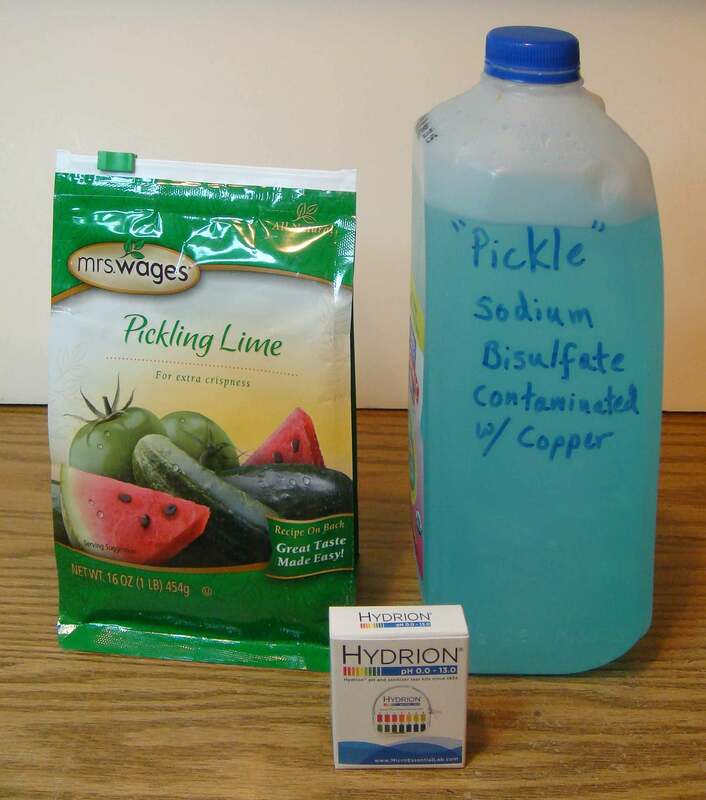 This copper contamination is NOT removed when pickle is neutralized with baking soda, so putting neutralized pickle down the drain is – from the perspective of a fish – like dumping cyanide into your local drinking water reservoir. If you dump copper contaminated pickle on the ground, it quickly leaches into the ground water, which is also very bad. It is extremely important that no matter where we live, we ALL dispose of this material carefully so as not to harm our fishy neighbors and further damage already beleaguered aquatic ecosystems! 1. Take your spent pickle to a local household hazardous waste disposal site. If you are disposing of your pickle at a hazardous waste collection site, be sure to mark the container with the actual acid used – not just “pickle” – AND append “contaminated with copper” to the acid named. You can see that the container in the picture above is marked “Sodium Bisulfate – contaminated with copper”. 2. Treat your spent pickle yourself to REMOVE toxic metals and neutralize acid. This is remarkably easy to do, and science in action is fun :)! Must haves: calcium hydroxide & pH paper with a range of 1-12.
calcium hydroxide (pickling lime or slaked lime – sold in the canning section of some hardware stores, and also sold as Kalkwasser in some aquarium shops – NOT lime from a garden store, that has no calcium hydroxide) – I bought 2 pounds from Amazon.com (in re-sealable 1 pound bags). For my approx. 1.5 gallons of pickle, I used less than 1 pound of calcium hydroxide. Safety first! Eye protection and gloves are de rigueur :). 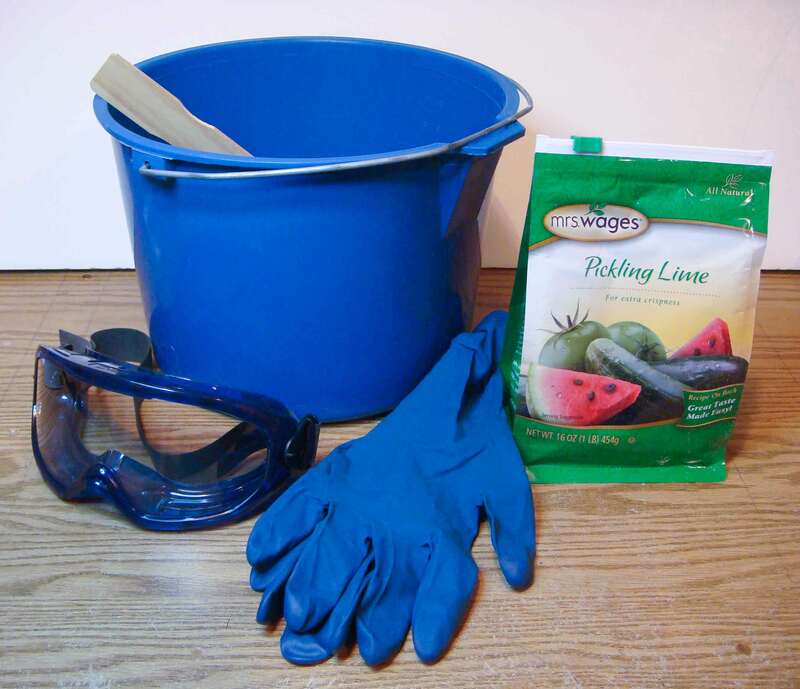 1) Put on gloves and splash goggles. Big deep bucket = lots of room to maneuver. 2) Pour spent pickle into deep bucket, filling it not more than ¾ full. 3) Test the spent pickle solution with the pH paper. 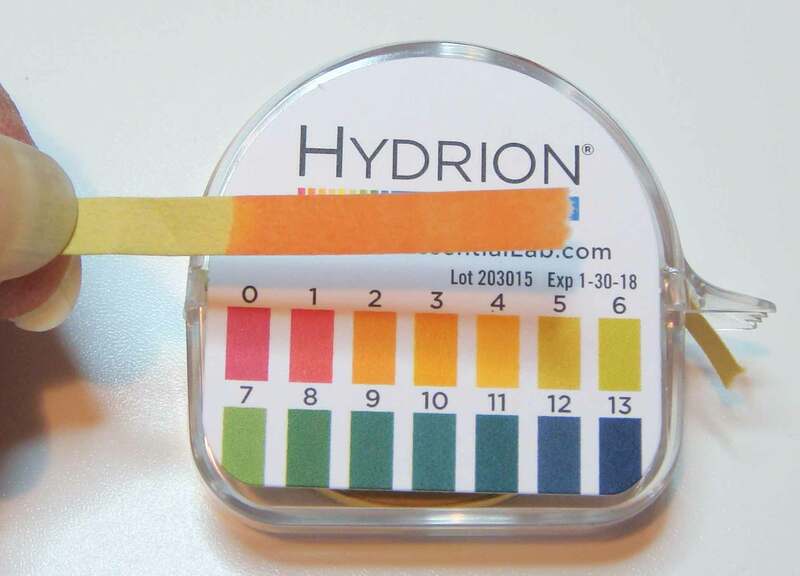 Dip just the tip of a short length of pH paper into the solution and compare it to the color coded chart on the pH paper dispenser. Make a note of the pH, which should be quite acidic (low number). Mine was at about a pH of 2 in the picture above. 4) Put a small amount of water (a couple of cups) in a small bucket or container. A pour spout is a handy feature here. 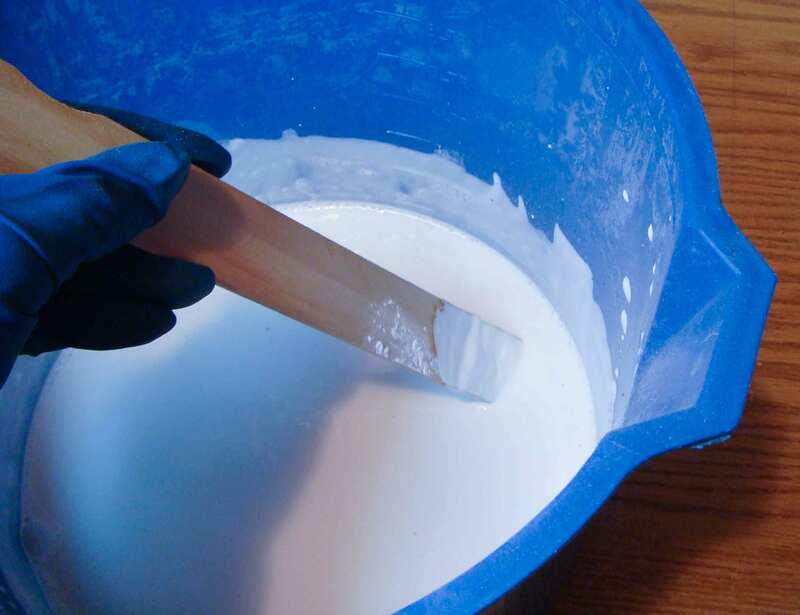 Use a stir stick to mix in the calcium hydroxide (pickling lime) until you have a smooth slurry. 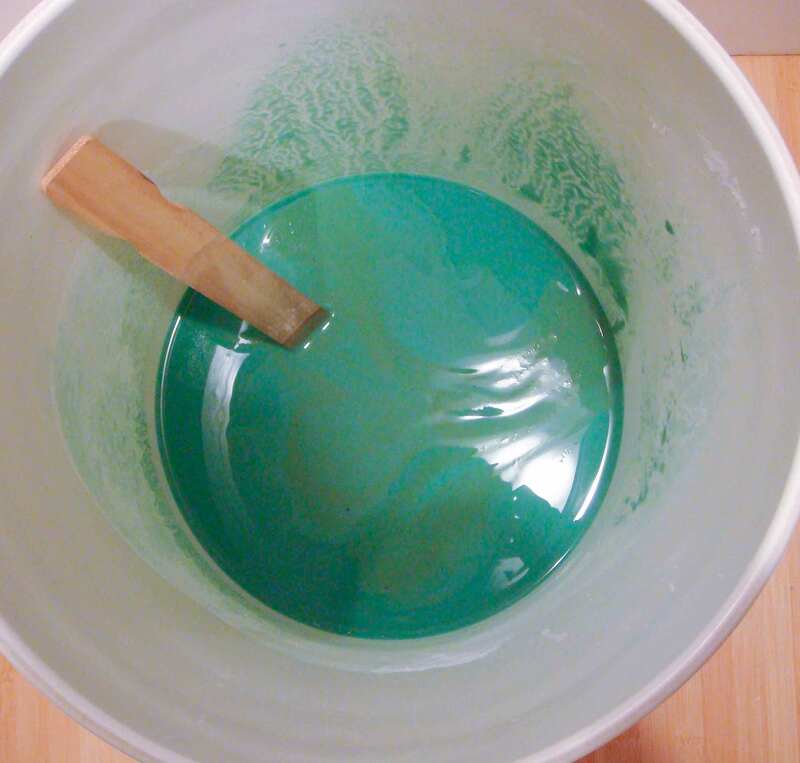 Add lime SLOWLY – it’s easy to overshoot the mark! 5) VERY SLOWLY – I repeat VERY SLOWLY!!! – add the lime slurry to the spent pickle and stir with a stick. If you pour quickly, it is very easy to add too much lime, and shoot past the desired pH of 9.
pH is at 7, so we are getting close! 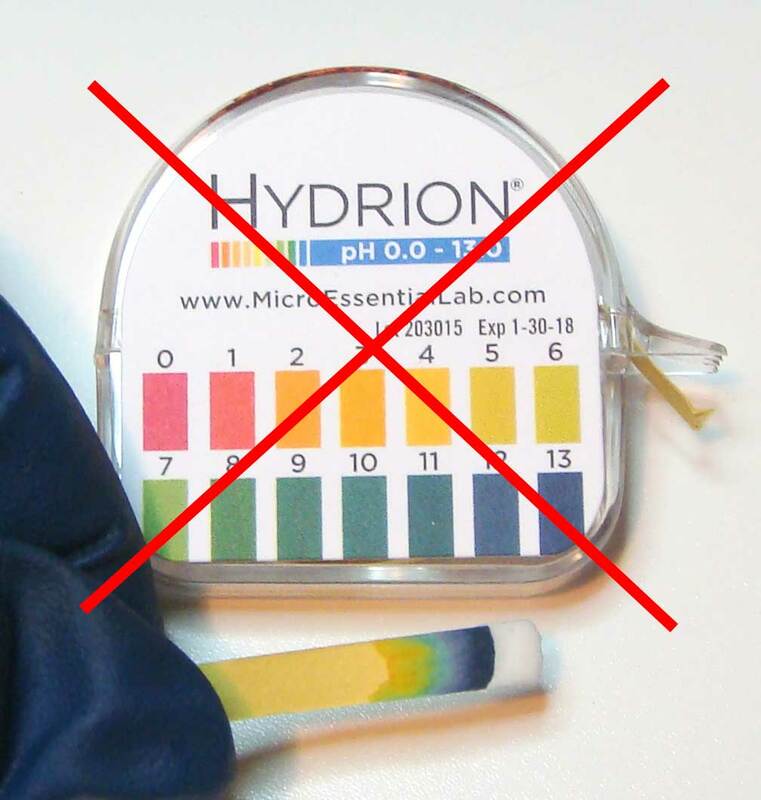 6) When the color changes to green and the solution starts to get cloudy, check the pH again. It’s coming along nicely and I’m at a pH of about 7 in the picture above. We’re there! pH 9. Check. 7) You want to continue (SLOWLY!) stirring in small amounts of lime slurry (and testing frequently with the pH paper) until you reach a pH of at least 9 (solution will be basic now rather than acidic). The final solution must have a pH of between 9 and 10, or you won’t pull all the copper out of solution and turn it into solids in the form of the cloudy precipitate. 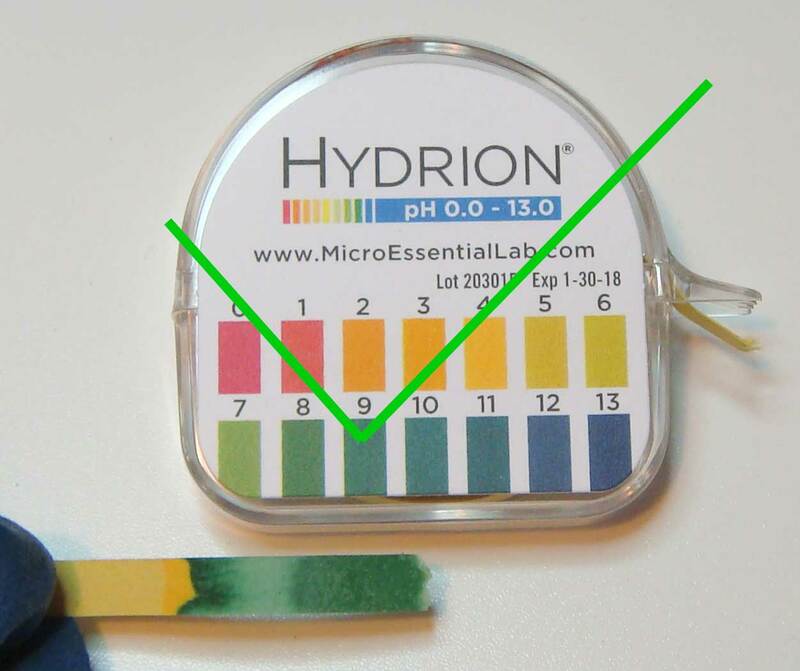 In the picture above, the pH test strip has reached the blueish-green color that indicates a pH of 9. So YAY for that :)! Too basic! 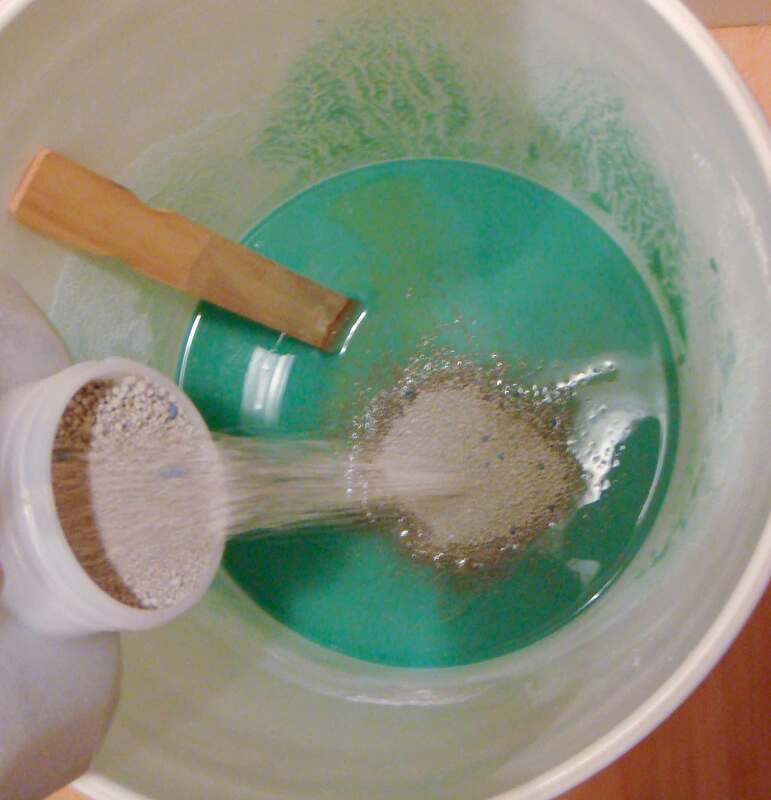 This is a pH test of the calcium hydroxide (lime) slurry. To show you what you DON’T want, this picture shows a strip of pH paper that has been dipped directly in the calcium hydroxide (lime) slurry. You can see the white lime on the end of the paper. Just behind the bit of lime, the paper is a dark blue, indicating a pH of 13, which is WAY too high. You don’t want to go past a pH of 10, or the tricksy copper will go back into solution. If that happens, all is not lost! Mix up a bit of fresh pickle and add it to your big bucket. This will drop the pH again, and you can have another go at creeping stealthily up on the desired pH by adding more lime. The fresh pickle doesn’t have copper in it, of course, but the additional acid will get you back on track. 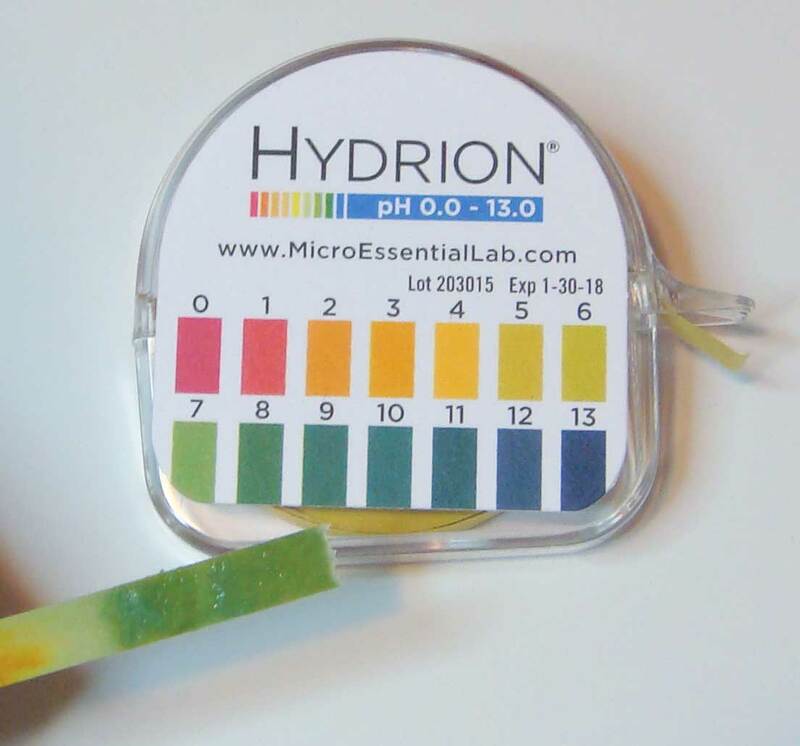 Test your pH again before adding any more lime. 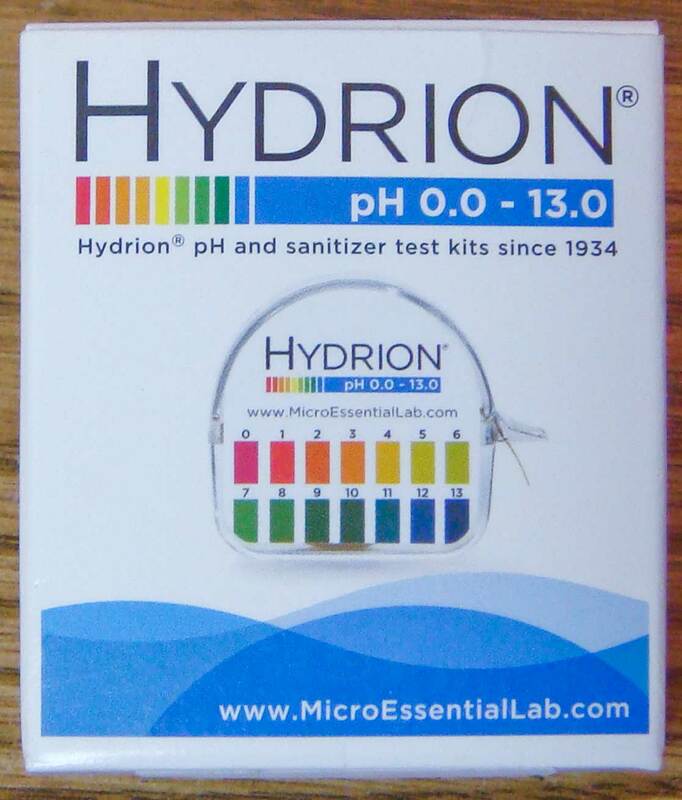 In fact, test your pH OFTEN, you have a whole roll of pH paper, and that’s what it’s for :). 8) Once you’ve reached a pH of 9 or 10, let the bucket of cloudy solution sit undisturbed overnight. The solid precipitate (copper hydroxide particles) will settle to the bottom. 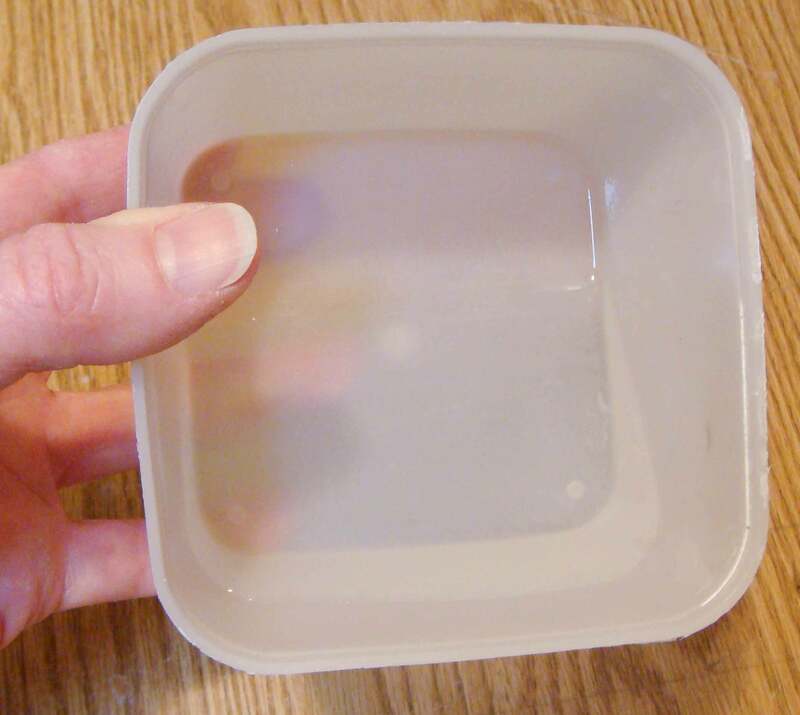 If the liquid above the settled solids is transparent, then you have successfully removed all the copper. If it’s still blue or green, then there is still copper in solution, and you’ll need to check the pH and adjust up (with lime) or down (with pickle) to get to a pH of at least 9 and no higher than 10. 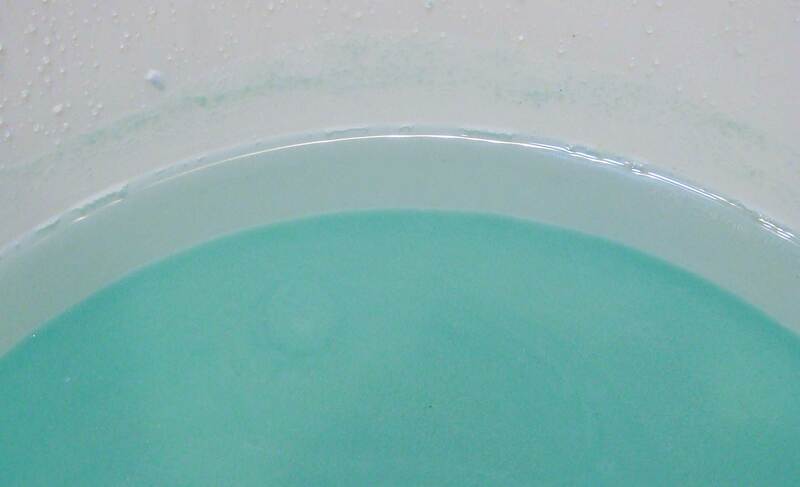 Liquid scooped from top layer of solution. Clear = GOOD! 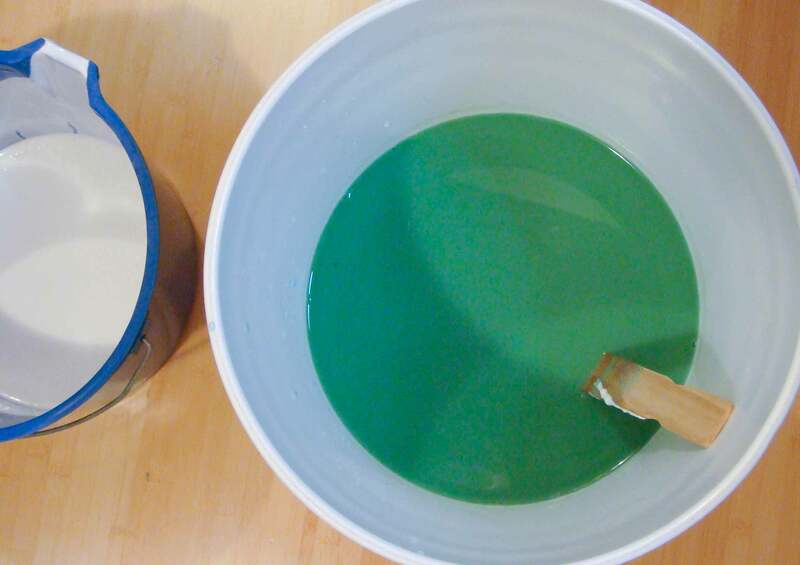 It’s hard to tell whether the liquid is clear when you are looking down into a bucket with a layer of GREEN precipitate at the bottom, so I gently and carefully scooped a bit of the liquid layer out with a small white plastic container (pictured above). Yep. It’s clear! On to the final steps!! 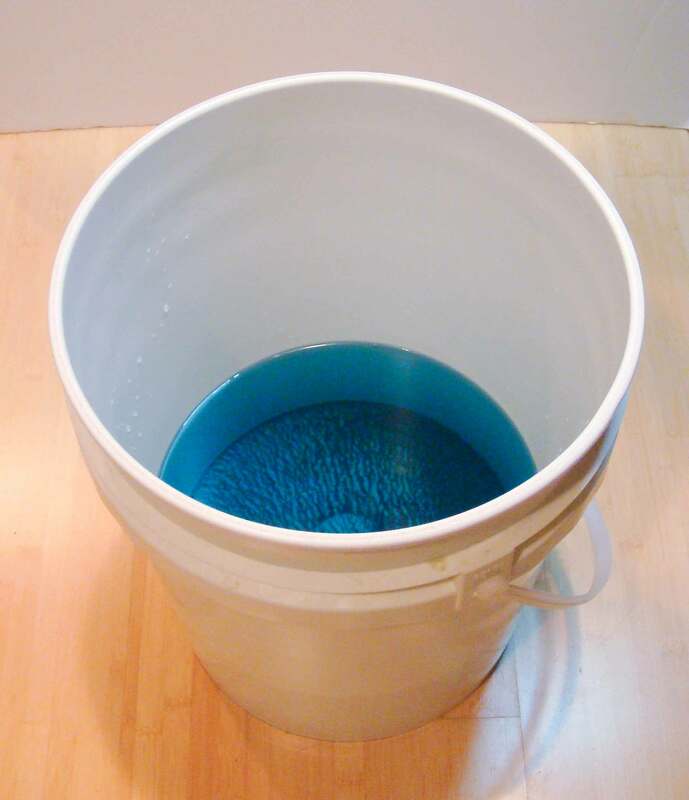 9) Gently lift the bucket and ever so carefully pour the clear liquid off, leaving some liquid and the solids in the bottom of the bucket. 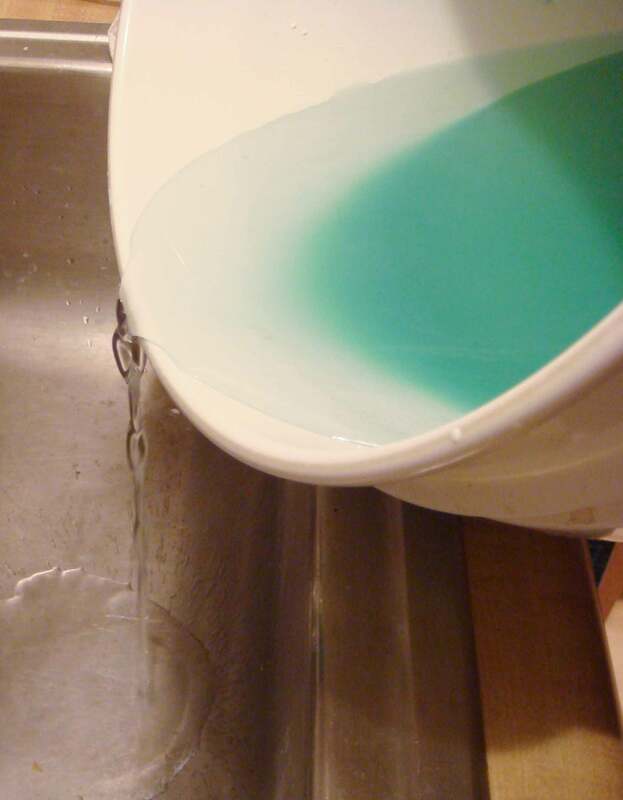 The clear liquid can go down the regular sewer/sink drain (not storm sewer!). Precipitate is VERY wet. Lots of liquid left in it. I bought the cheapest clay-type cat litter I could find. It was almost over-poweringly perfume-y… but I was so close to the end, so I soldiered on. 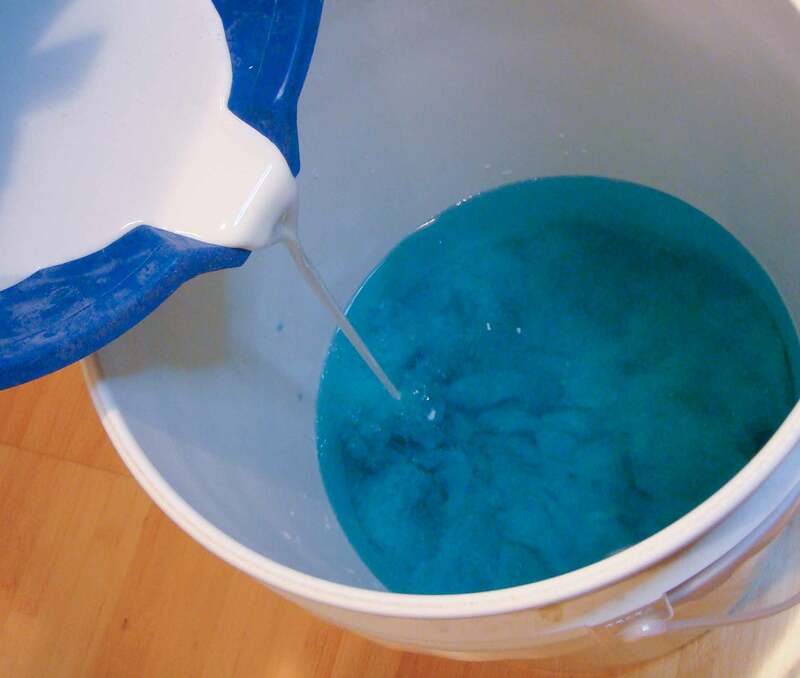 10) Allow the remaining liquid from the resulting sludge to evaporate — or mix with kitty litter to form a solid. 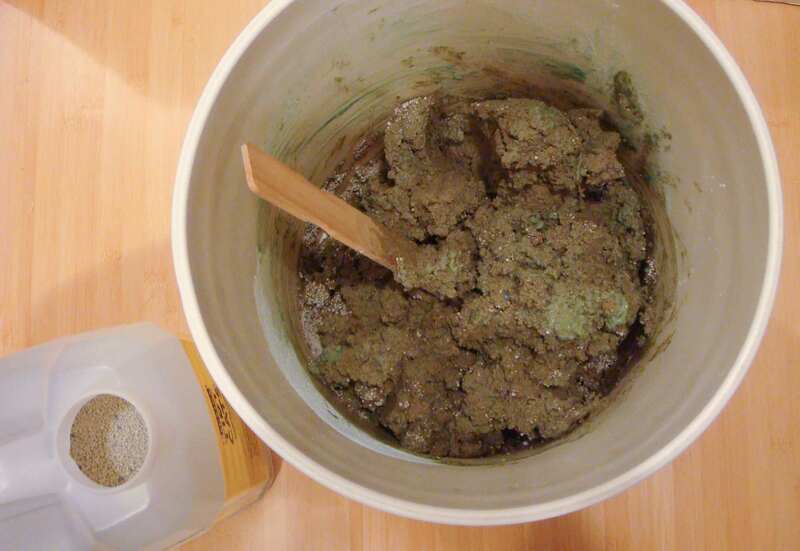 The precipitate and liquid left from treating about 1.5 gallons of pickle required around 10 pounds of clay-type cat litter to absorb all the liquid. My hand for scale. The kitty litter route makes a pretty big bag of trash! 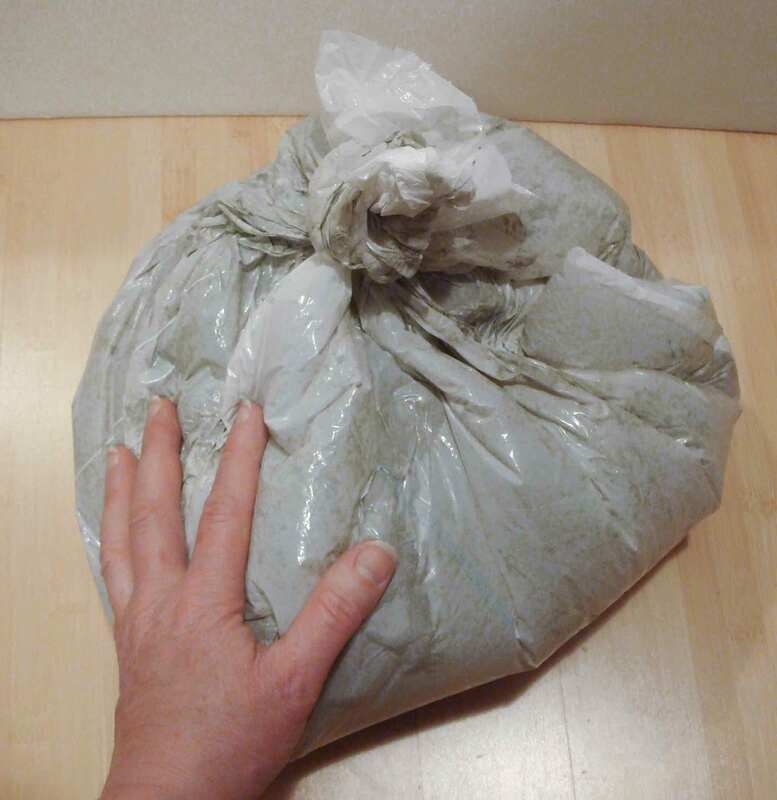 Bag the dry solid result and dispose of in trash. EPILOGUE: You very probably have some of your calcium hydroxide lime slurry left over. You can either store it in its slurry form – properly marked as “Calcium hydroxide – corrosive slaked limewater” – until the next time you need to treat spent pickle. It keeps well. Stir it up before using it again. 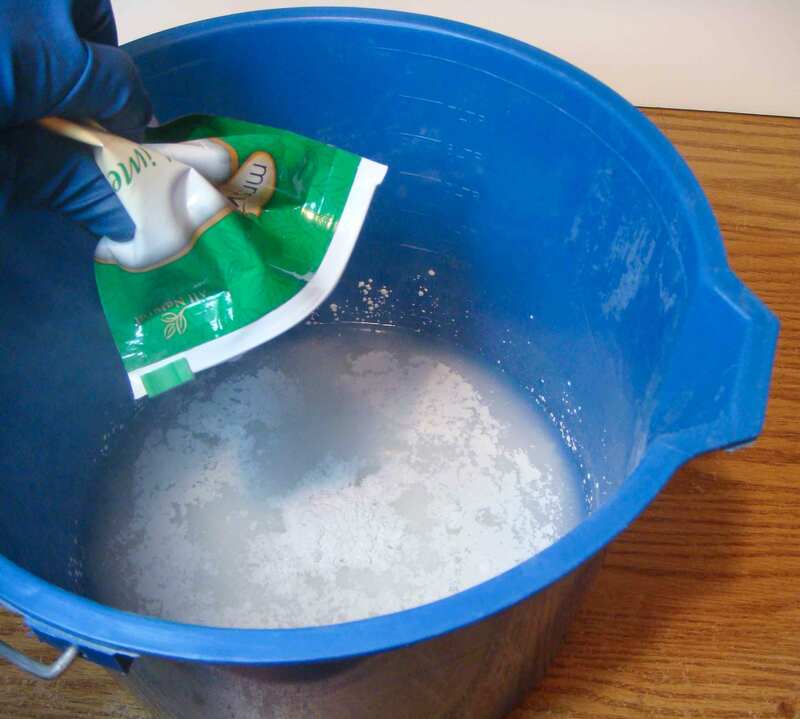 Since it’s a strong base, don’t store it near acids. If you don’t want to store the slurry, you can pour small amounts – a pint or less at a time – down your toilet. What I did was let the slurry dry out completely, and then broke it into chunks and put it back into the bag it came in to store it. It keeps well this way, too, and is ready for the next time I need to treat some pickle. That’s it. Done and dusted! Thanks for caring, standing with the planet, and protecting all the fabulous life in the water around you. P.P.S. (added 3/24/16) Here’s a nice graph of the theoretical solubility of metal hydroxides vs. pH, which shows a really clear low point on the line for copper (Cu) at pH 9. This is why knowing the pH is so important, since the copper begins to go back into solution above pH 9. 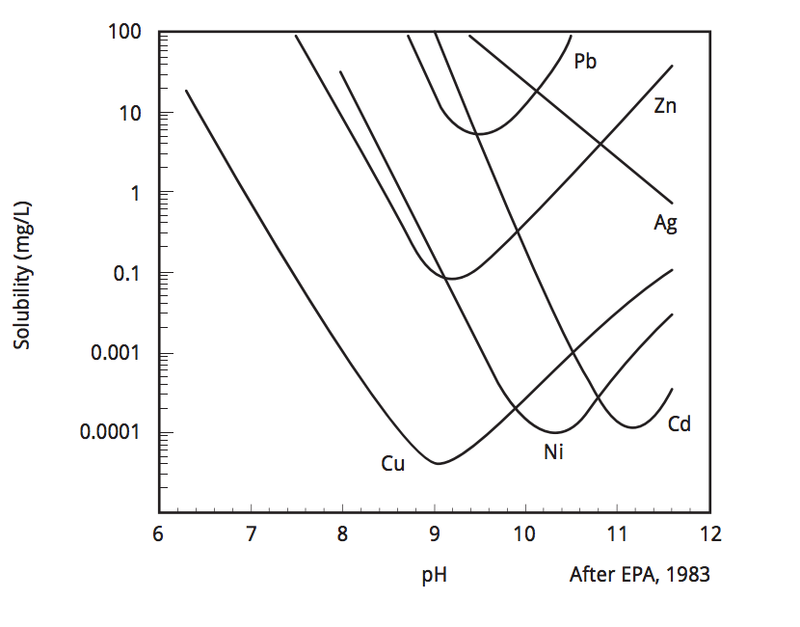 Theoretical solubility of metal hydroxides vs. pH – note that copper (Cu) has a sharp “V” at pH 9! *Dave Waddell from Local Hazardous Waste Management Program in King County, WA, told me about the toxicity of copper to aquatic life, and taught me this method for treating jewelry pickle. Dave can be reached at (206) 263-1673, and at dave.waddell@kingcounty.gov. Sadly for us, Dave is retiring on June 24th, 2016. He will be much missed by the arts community he has done so much to help! He urges people to contact King County’s Business Waste Line for help and information. Their number is (206) 263-8899. This entry was posted in Studio Chemistry and tagged calcium hydroxide, citric acid, copper, disposal, fish, hazardous waste, lemon juice, pH paper, pickle, safety, sodium bisulfate, sulfuric acid, toxic, vinegar. Bookmark the permalink. 19 Responses to Be Kind to Fish! Dispose of ALL Spent Pickle Responsibly. Julia, You are a GEM!! Thank you for all your amazing suggestions. I reckon this is one of the best, for all of us who do care about the environment,but may not know about this copper contamination. Thanks, Eva! I think it’s one of my more important posts, too. I hope others agree :). Wow. Thank you for providing clear, concise information on the pickle disposal problem as well as a solution (oh dear, unintended pun–sorry). This will be posted in my studio with the chemicals. Thank you for tutorial. I have a bucket of spent pickle in the basement as I keep missing the drop off day for hazardous waste. Now i can take care of it safely. I also have a septic system and live on part of the Erie Canal, which has been contaminated enough without me adding to it. Thank you for this thorough explanation! I will definitely put this into practice and share with my jewelry community. Do you have more info on the copper solids if you allow the liquid to evaporate without adding kitty litter? I’m curious what exactly is left, and if it’s usable or refineable in that form? For example, my husband is a ceramic artist and can often use copper in his work- is this a possibility? Also, is it really safe, environmentally, to throw the copper solids in the trash, or is there risk that it will eventually leach back into the environment? Thanks for any additional info you might have! Hi Kate, The solids formed are copper hydroxide, Cu(OH)2. There is probably some other solid crud in there, too, from the bits of soldering pad and such that get dragged into the pickle pot stuck to the flux on your jewelry pieces. I guess the utility it contains is represented by the fact that it’s binding up the copper ions in a form that keeps them unavailable. Copper hydroxide is insoluble, so it won’t leach. It is possible, of course, that it could react with other materials in the future and then leach, but the risk of that happening is much much lower than the risk to the environment from putting pickle down the drain. So we do what we can to lower the risks. If you let the liquid evaporate, you will definitely end up with less material to throw away, and you can skip the smell and extra weight of the cheap cat litter! Thank you so much, Julia. I’ll make sure I’ll save this info. Very valuable for our environment. Can you tell me why the lime shouldn’t be stored near acids? Is there an explosive factor? Does that include storing the package as well? What a fantastic article. I’m so pleased, I only make a small amount of homemade pickle at present, but was unsure of how to dispose of it best. This is great. Thank you! Why can’t you just dump the neutralized pickle in the Kitty Litter and toss it in the trash? Hi Rio, thanks for asking this question, which I’m sure others are wondering too :). Unfortunately, the copper won’t stay stuck in the kitty litter. Since the copper is still in a water soluble state, as soon as the litter gets wet, the copper will leach away into ground water, or any nearby waterway or body of water, there to do it’s toxic work of killing aquatic life. Landfills and dumps are not dry, so the copper is almost guaranteed to leach out if it’s not treated to convert it into a solid form that is not water soluble. Excellent info! Thanks for sharing! Is it ok to simply let the pickle dry out, scrape it into a paper towel and then bag it up in plastic? No water is involved. Then I just put it in the garbage. Hi Barbara, I’m sorry to say that NO, it’s not okay to simply dry out the pickle. The problem is that when it gets wet again (as it ALWAYS will in a landfill), the toxic copper will contaminate the water it leaches into. You can dry it out and then take it to a Household Hazardous Waste collection site (you can also take the un-dried version to HHW). If you want to dispose of it in the trash, you MUST do some chemistry to convert the water soluble molecules into a non-water soluble form. Sadly, simply drying it out won’t do that. 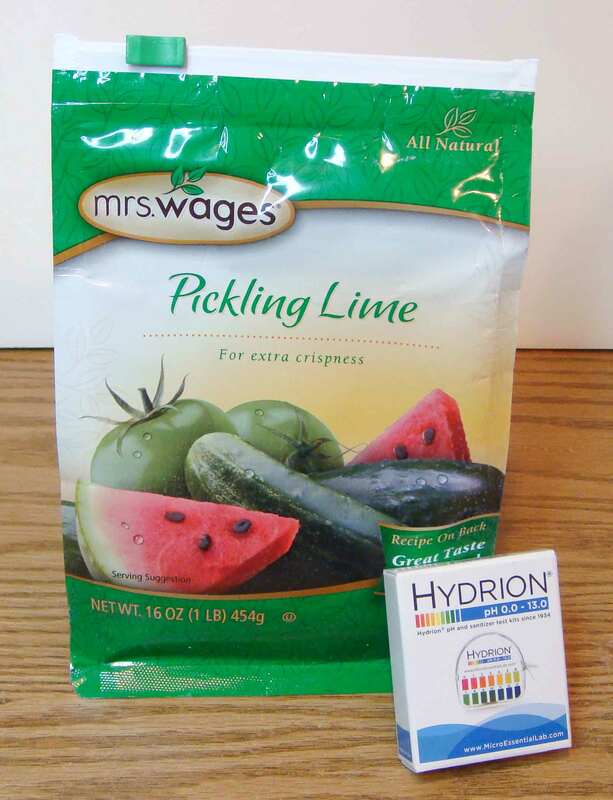 Can you skip all the testing and mix your pickle with cat litter, then dispose of it in your regular waste? Sadly, NO!! If you don’t want to treat it properly yourself, you should take it to a Household Hazardous Waste collection site. Unfortunately, the copper in the pickle won’t stay stuck in the kitty litter. Since the copper is still in a water soluble state, as soon as the litter gets wet, the copper will go right back into solution, and leach immediately into ground water, or any nearby waterway or body of water, there to do it’s toxic work of killing aquatic life. Landfills and dumps are NOT dry, so the copper is pretty much guaranteed to leach out if it’s not treated to first convert it into a solid form that is not water soluble.